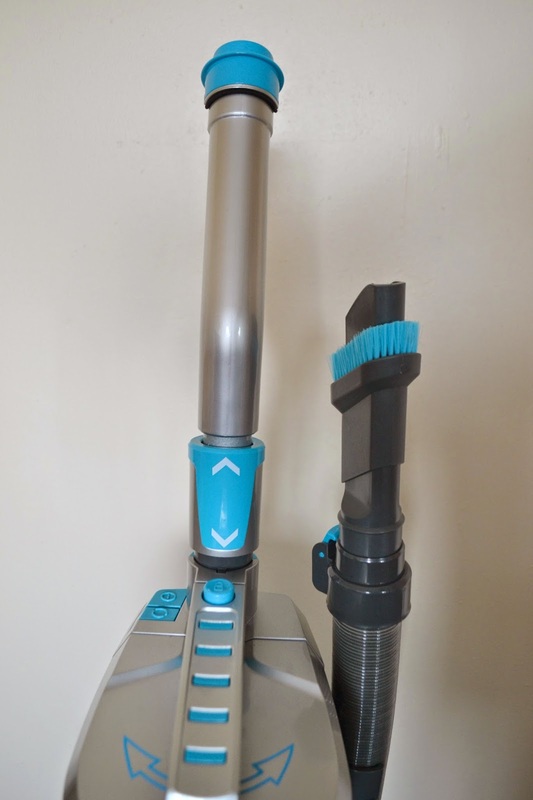 Over the past few weeks we have been reviewing a vacuum cleaner. To some this may be boring but for me it was quite exciting. Being a mum to two children our house gets messy. There is no hiding that fact, children create mess and chaos. They spill things and gets crumbs everywhere. Add into that a pet, we have a cat, and a husband and I'm pretty much always hovering up. Because we have a pet we need a hoover that can cope with the additional pet hair. This is where the Vax Air 3 Max Pet comes in. The Air 3 Max Pet is an upright vacuum cleaner. It is lightweight, powerful, has a large capacity, a long hose and a long cord. The vacuum cleaner was very easy to put together, there wasn't much to do. As you get it out the box all you have to really do is attach the handle, this meant it was ready to go within seconds. Before I comment on the use of the vacuum I wanted to mention the look. After all it has to be used very regularly and we keep ours in a downstairs open cupboard so people regularly see it. I think it's a lovely looking hoover if there is such a thing. It is a gorgeous blue and grey. I think it looks quite stylish for a vacuum cleaner. The first use was very interesting. Our old vacuum cleaner was just that... old! It was super nosy and not very good. Paige was scared of it because it was so loud. So when I switched on the Air 3 Max Pet I was so shocked when Paige came straight over to it and wanted a go. We let her have a little push because we wanted to try and get her used to this vacuum cleaner and to not be scared. When I finally got my hands on the vacuum I was shocked. The suction is amazing, so amazing that you actually feel like you are getting a workout when you vacuum a whole room. You can really see and feel it working. 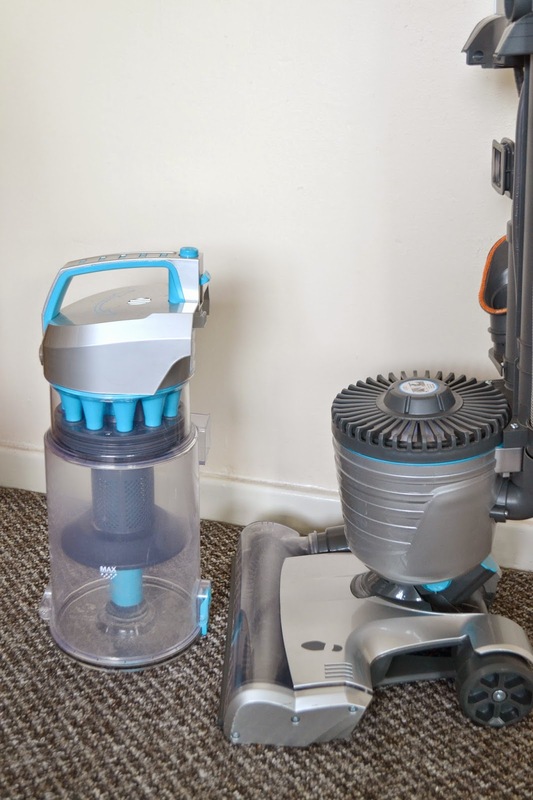 The 3l capacity mean that it can be emptied a lot less frequently than other vacuums. When it is ready to empty you simply press one button to take the container off the vacuum then press a switch and the bottom swings open and the waste is gone. You don't have to touch it which makes it a lot less dusty. The handle is really comfortable to hold and I love how it adjusts in height. You hold the handle with one hand and the round piece with the other and pull in opposite directions. The Air Motion Technology make twisting and turning around furniture so easy. The vacuum is really easy to maneuver. 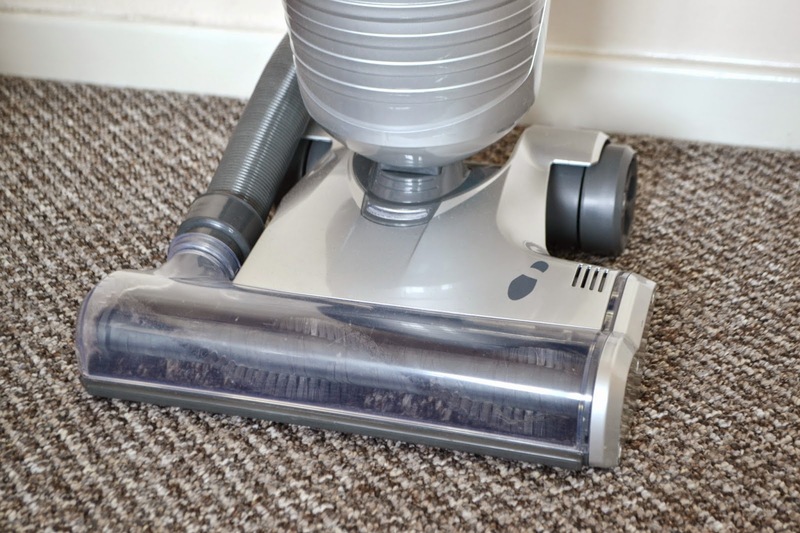 The suction does take some getting used to especially on thicker carpets but it defiantly isn't a big thing to have a vacuum with a strong suction. I love the TurboTool, it makes light work of pet hair which is perfect for when Millie likes sleeping on the sofa. It is super easy to attach just like the other attachments. With our old vacuum I used to hoover the bottom half of the stairs, unplug and carry it to the top and then hoover the top half because the cord wasn't long enough. Now I can easily leave the hoover at the bottom of the stairs and hoover all the way up the stairs. But because the hoover is so light when I do need to carry it upstairs it is super easy. While upstairs I like to start in one room and work my way around the house. I can leave the hoover plugged in our bedroom and it still reached Paige's and Parkers rooms! The cord is 10 metres long! It also works on hard floors. Everywhere else apart from the bathroom and kitchen is carpets so it's nice to have a hoover that does both. 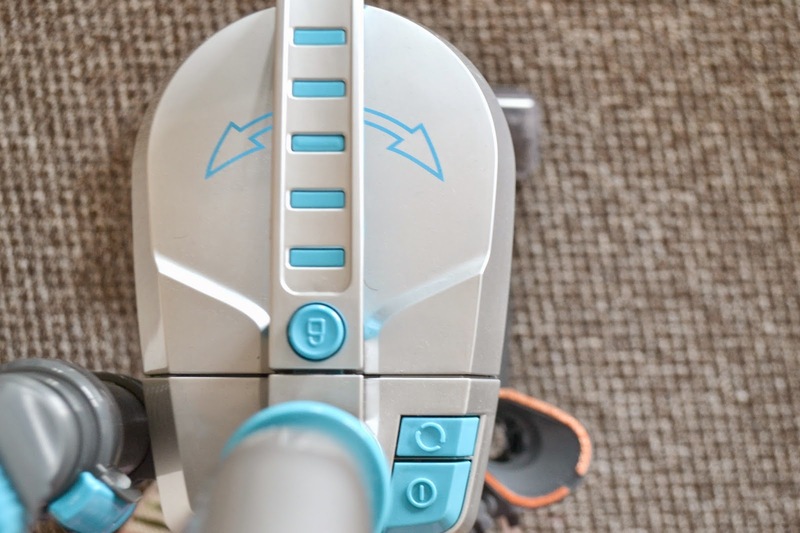 There is a button on the top of the hoover that lets you switch the brush on and off which means you c an switch very easily from caret to hard flooring. I was worried when we first tried out the hover about how it would cope with my thick carpet. Our old vacuum had a setting to allow for different thickness of carpets. But the Vax copes perfectly. The suction gets a little stronger on a thicker carpet so it becomes harder to push, at least for me. I'm not the biggest of people but it is perfectly manageable. The foot print on the above picture is where you place your foot to pull the handle down so you can start. Being on the left side it makes it slightly awkward at first. I mainly use my right foot for things like that but it doesn't take long to get used too. 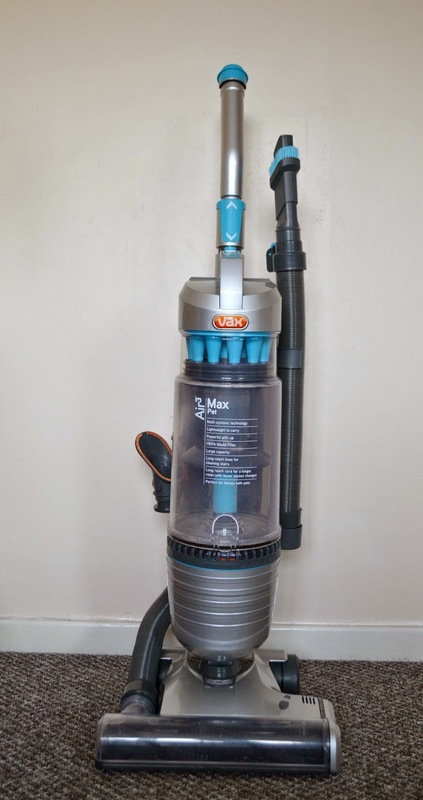 Overall I really love our Vax Air 3 Max Pet. It is hands down the best vacuum I've used. My dad and his partner came round and actually ended up hovering our living room for us as they loved the vacuum so much! The Vax Air 3 Max Pet retails at £299.99 and comes with a 6 year guarantee. Is a vacuum important in your house? Very nice vacuum. This is very useful. I will buy one for my family. Vax are better than dyson give me a vax any day over dyson. Hi, Very nice article you have shared here. I think your present experience of using new vacuum cleaner is pretty good than the previous one. 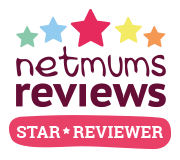 Your review will help people a lot to decide for a new one. Thank you for your excellent writing. This is a great review. This is a very good product. Very nice vacuum. This is very useful. I will buy one for my family. Thank you for sharing this informative post with us. This is very good review.It will be great helpful to use it in our house.But i think its too costly.By the way thanks for sharing. The element which makes this blog unique is the optimism seen throughout. These websites are really needed, you can learn a lot. I will buy one for my family. Thank you for what you are sharing very helpful.